Hot Toys has been doing an amazing job with all their products this year, but I have to say that the overall work on the Iron Man line is their best. 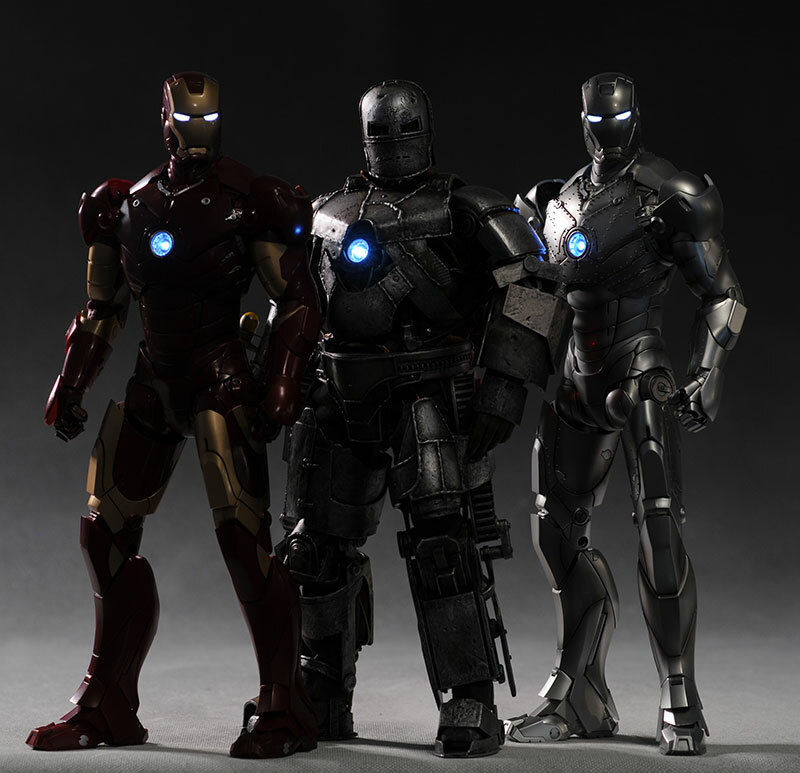 While they have produced a figure here or a figure there in other licenses that rival any of the Iron Man figures, the collected work is truly most impressive, including the Mark II, Mark III and Tony Stark suit. 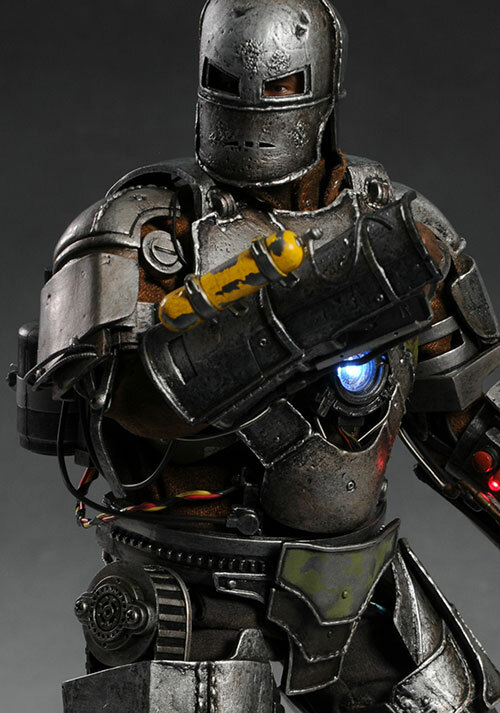 They round out the offering with their new Mark I, and after getting this figure, I can confirm that I'd sell my dog to get an Iron Monger. And I love my dog. While you could pick this guy up through Sideshow (or any number of other distributors world wide), there was no exclusive version. That's fine, since this guy was already going to cost you around $160 - $170. Hot Toys hasn't made any other announcements around this series, but they do have the SDCC exclusive version coming out this month, at the show of course. 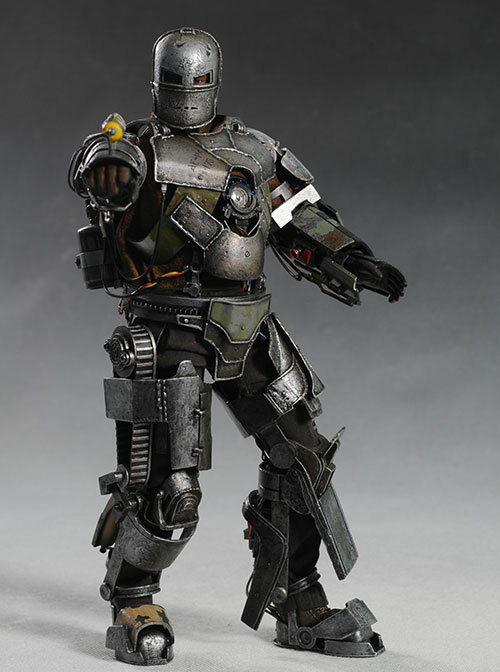 Available through Sideshow, this 'gun metal' paint job seems relatively obscure right now...but you just wait and see. My bet is that this paint job will show up in the second movie as some sort of 'stealth' mode, since Tony almost got shot down by fighter jets once. With the second movie coming, it's a pretty safe bet that we'll see Hot Toys expand on the license next year. We know the villain will be Whiplash, portrayed by Mickey Rourke, a guy with the perfect face for the Hot Toys treatment. Scarlett Johansson is playing Black Widow, and Hot Toys has already done a terrific sculpt of the beautiful actress for The Spirit line. And maybe War Machine and Nick Fury will get enough screen time to warrant their own figures...this is a series that could see quite a few additions in 2010! Like the previous two Iron Man figures, this one comes in the cool interior wrap around box with lots of interior panels. The exterior sleeve is done up like a shipping crate, complete with appropriate labeling. The packaging has the usual great graphics (including the embossed chest light that sits inside the wrap around layer) and text, and is almost completely collector friendly. There's some of those damn twisties though, and you know how much I've come to despise them over the years. Let's talk Tony Stark here, since Hot Toys has been working on capturing his portrait with all three figures. With the first release, the Mark III suit, they provided a completely separate head, unencumbered by any helmet. Pop it on another TrueType body, throw on a suit and voila! Your own Iron Man alter ego. But the head sculpt wasn't quite Tony Stark...it was closer than any we'd gotten up to that point, but it missed the mark slightly. 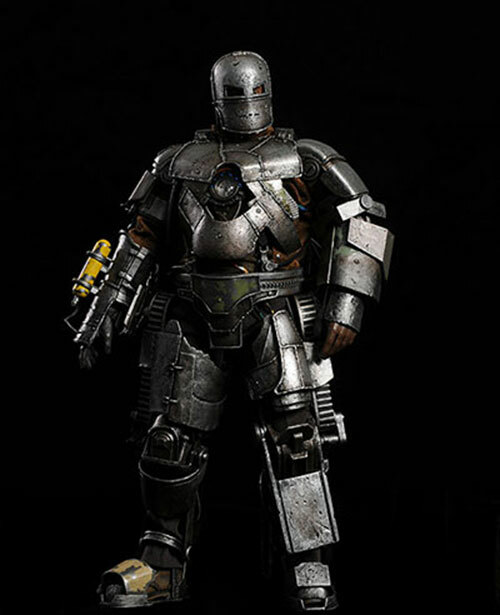 Then the MK II suit was released, again with a completely separate head. This time though, it included a removable helmet, so it's intended to be used with the armored figure. This portrait was an improvement on the first, but it still wasn't the out of the ball park home run that we've come to expect from Hot Toys. And now we have the Mark I. This time, there's no extra head. You get one, with a removable/lift-able face plate. Underneath that face plate is a new portrait, and once again, it's an improvement over the previous two versions. It has all the realistic texturing and fine detail that we've come to anticipate, and it is closer to the Downey Jr. Stark than the previous two. In fact, I doubt we'll get one better...but it's still not quite perfect. Yea, I'm probably being way to picky at this point, but there's still something off in the eyes and eyebrows, at least for me. The hair is of particular note. Not only are the strands of hair over the head sculpted with a very fine detail, but they've done something rather unique with the loose hairs. Rather than try to space them out from the forehead, they've sculpted them as part of the forehead, as though the hair is sweat plastered right to his face. That might seem to be the obvious way to do it, but the big problem with this approach isn't the ability to sculpt it this way - it's the ability to paint it cleanly. Because of the exceptional production paint work, which I'll discuss more in the next section, Hot Toys has the option to use this approach, and it worked extremely well. There's a small groove sculpted into the very top of Tony's head, which allows the face plate to move up and down. The regular hands are sculpted in an open, gesturing pose, while the extra hands are fists. Both look to be scaled pretty well, and work with most poses. I'm only counting the portrait head sculpt and hands for this category, this time. I'm leaving the armor for the 'outfit' section, but I will say that if the armor were part of my consideration for this category, there'd be four big stars handed out. As with the Sculpting category, I'll be discussing the paint work on the armor in greater detail in the Outfit section, so I'll focus on the work on the head here. I mentioned that Hot Toys ability to paint the small loose strands of hair on Tony's forehead cleanly is the reason they were able to sculpt them that way in the first place. It's amazing how clean these edges are, considering that this is a production paint job. Hell, it would be amazing for a custom one! The facial hair and eyebrows are also well done, but I have to say that the eyes seem a little more lifeless this time than usual. This was also the case with Billy and Dutch in the Predator series, and I'm hoping this doesn't become a trend. However, it's not as bad as it was with Billy, and it's only on very close examination that you notice the difference from something like their Godfather figure. The minute work on the hair manages to override the eye issue enough for me to still get them a full four star score. I'm not giving this figure four stars in this category because it's more articulated than other sixth scale figures. Obviously, the armor is going to restrict the figure to some degree, and the underlying body is still the standard TrueType. But I'm giving extra credit here in recognition of the engineering and design work that was necessary to make this figure as poseable as it is, given the bulky, thick armor. You know that show "Modern Marvels"? Yea, they need to do a feature on this figure. And that's coming from a guy who's an engineer by training. It's important to realize that this is actual armor over a clothed TrueType figure. While the armor isn't designed to be removed - it's far too complicated for that - it does make it much more realistic in it's design. It also means that there's a ton of hidden articulation. 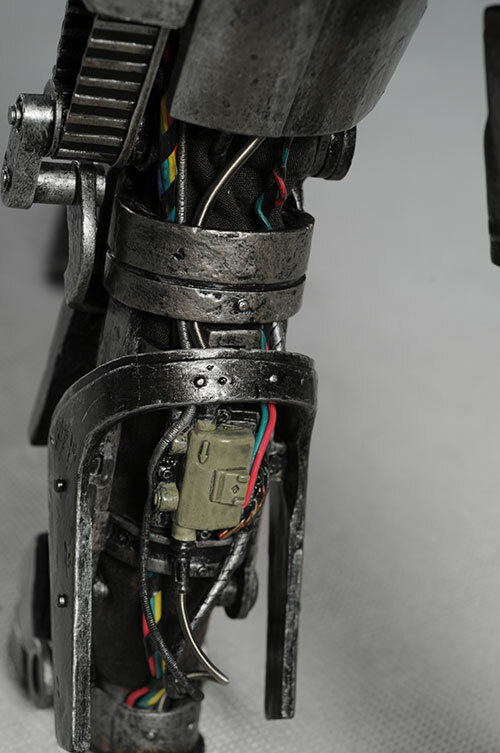 The armor on the right knee flips up, as does various pieces on the right and lift shin. The protective pieces over the wrists move forward to protect the hands, and various other smaller pieces that look like the might be articulated usually are. The best part is that the armor doesn't restrict the underlying body nearly as much as you'd assume. 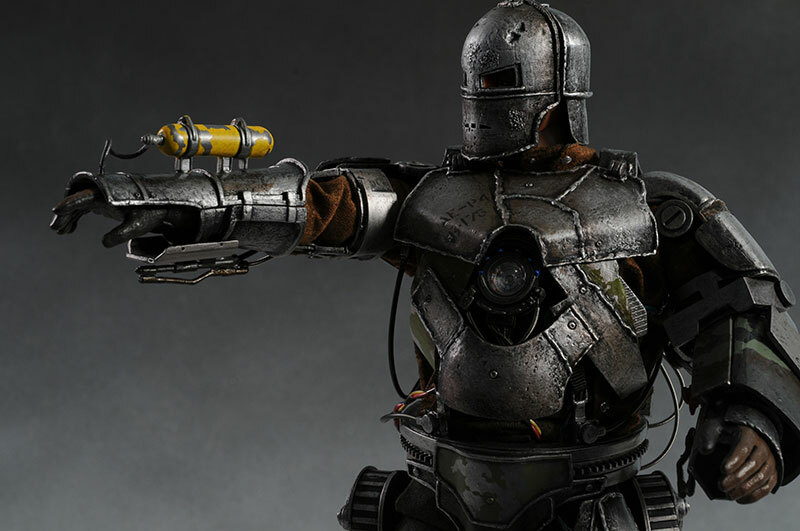 I mentioned this with the earlier Mark III and Mark II suits, but it bears repeating - unlike other companies that assume any figure with armor is going to be unarticulated and then proceed to fulfill that destiny, Hot Toys assumes nothing going in, and makes the figure far more articulated than you ever expected. Key joints, like the neck, shoulders, elbows, knees, wrists and ankles, have quite a good range of movement. The figure can take fairly deep stances, can pose in as natural way possible, given the outfit, and can take key poses right out of the film. For example, this figure has to be able to raise both arms high enough to allow for firing poses. But the shoulder armor is clearly too restrictive to allow the shoulder to raise that high. So how do they accomplish it? 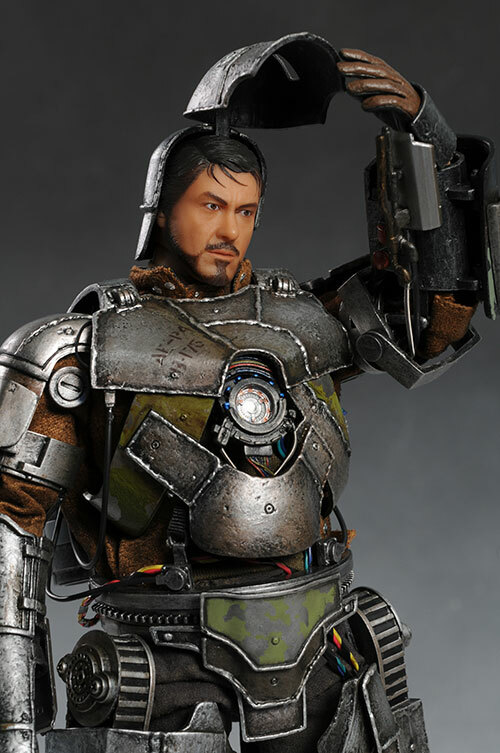 Simple - the shoulder armor and bicep armor are not connected, and in fact, the bicep armor is designed with a grooved section to allow it to turn underneath the shoulder plate. That means that you can turn the shoulder itself backwards, getting the shoulder plate out of the way and allowing the shoulder to rise to the proper level, then turn the bicep back forward to bring the arm properly in line! Had they simply gone the cheaper route, and made the shoulder and bicep armor all one connected piece (or sculpted them in such a way that they couldn't turn against each other), this key pose would have been lost. The left arm opens up as well, revealing a small, red rocket. Getting this open is a bit tricky (push down on the larger piece that is to the outside of the arm before pulling it open) but once you manage it, you can also remove the rocket. Every time I pick this figure up, I find a new point of articulation. The figure seems even more poseable to me than the Mark II and III suits (in fact, the head can lean back further, making a better 'in flight' pose), something I didn't think possible with the thicker, more cumbersome armor. It's rare that a figure has better articulation and posability than the actual human wearing the costume, but I suspect that this is one of those times. Unlike his cousins, this is one area where the Mark I doesn't quite live up. This is probably due to the extreme amount of detail work that was done on the armor, but the lack of accessories is still quite notable. He does have an extra set of hands, both in fist poses. They swap easily enough, and look about the right scale in the large, massive armor. While you'd think the fists would be better for the 'firing' poses, I found that it varied, at least to my taste. I liked the open right hand when I posed him with an outstretched right arm, but I preferred the fist when he had the outstretched left arm. Your mileage will vary. There's also the lift-able face plate. The mask looks great, but it is very difficult to attach. I don't know about you, but wearing the mask is how he's going to look on my shelf, so keeping it attached is a top priority, and once you do manage to get it snapped into place, it stays. In some of the photos, I shot it without the face plate to show the option. With the face plate raised, it seemed to me that he appeared to have a bit of a pin head, but with the mask down, he looked great. I suppose the removable rocket is also an accessory, but I'll be leaving mine right where it is. One less thing for the cat to play with. He also has the basic black display stand, complete with logo and name plate. He stands great on his own, but the nervous collectors might be too afraid that he'll fall over time. If you do decide to use the stand, be careful hooking it on, since you could easily damage or bend one of the many wires or hoses. The original suit lacked the light up eyes, but Hot Toys makes up for it by adding a little something something extra. The chest lights up of course, as his power source brightly illuminates when you press a button on his back. The batteries are ingeniously housed in one of the cannisters on his back, and there's no screwdriver necessary this time. Instead, the bottom of the canister simply turns to open and close. As before, the LED is nice and bright, so bright that it's practically blinding if you look at it straight on. I've included a photo to the left to specifically try to give you some idea just how hot this thing glows. I didn't have any problems with the light bleeding out in places it isn't supposed to, but because it's so bright, there are blue reflections on other pieces of armor at times. The something something I mentioned is the small red LED light on the inside of his left arm, below the rocket launcher. Including it was a nice touch, since this figure lacked the light up eyes or palms that his cousins sport. Okay, let's be honest - this is where it's really at. The number one feature with this figure is the armor, and it's a true work of art. First, there's the sculpting. 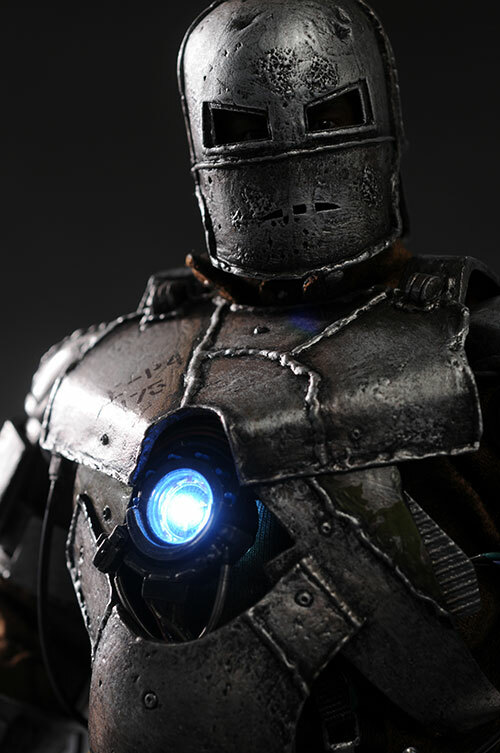 The armor pieces include the texturing that gives it the hammered, hand forged appearance of wrought iron, with realistically harsh and thick weld lines. This looks like a suit built in a middle eastern cave, from whatever spare parts were available. There's also an excellent use of multiple materials. Small wires are real wire, while larger hoses are springs that replicate the appearance of the real deal extremely well. Smaller belts are actual rubber, and there's even itty bitty electrical tape used to hold wires, tubes and pieces together. The sculpt also matches the source material extremely well, although if you look for movie stills, it will be tough to find too many clear shots. The sequence in which this suit was featured was dark for much of the time, and involved lots of action and explosions for the rest of the time. The amazing sculpt wouldn't be much though without amazing paint to back it up. Here, we see some of the most realistic looking plastic-as-metal paint work I've ever seen. They've also included the logos and colors that would have been present on the bomb husks used for plating, and the weathering and basic damage is perfectly represented. Small paint details are every where, and when something should be clean, it's clean, when it should be dirty, it's dirty. Some have commented that the small tank on his right arm seems to yellow, but from the few photos I could find, it looks pretty accurate to me. I suspect they were working off the actual suit prop rather than movie stills, because the colors seem to match better there. Remember that the coloration of items in the film itself are often changed post production, and subject to conditions of lighting. The suit fits over the underlying TrueType body perfect, and yet, is clearly a separate entity. Underneath the suit, Tony is wearing his desert boots, gray pants, and fuzzy brown shirt/sweater. EDIT: an astute reader pointed out that it's his welder's shirt under there. Yep, sure is! Looks great too, but I don't remember him wearing it in the cave. Of course, it's close enough in appearance to the brown sweater he wore that he could have had it on when dressing in the armor, and I wouldn't have registered the difference. There are a few minor quibbles with the clothing underneath (the pants could have a bit more of a pin stripe), but they are so minor as to be irrelevant. 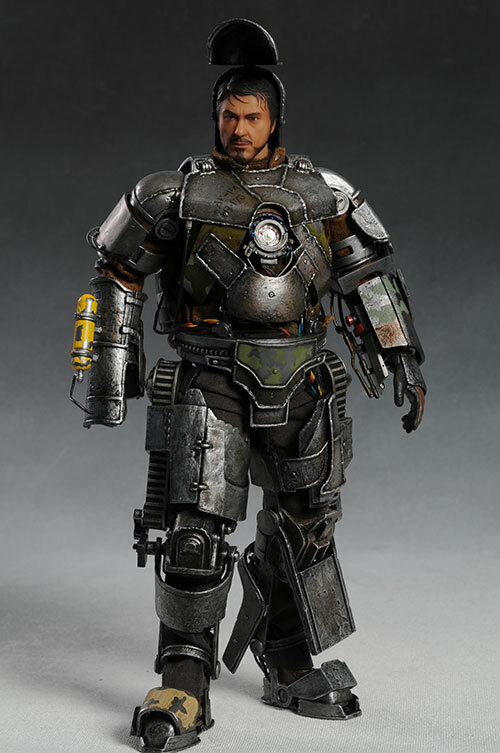 The costume is truly an impressive feet of design and execution in sixth scale, and the greatest weight is going to go to this category when I consider my Overall rating. Hey, I had plenty of fun shooting this guy, but that's not really what I'm talking about here. If you're looking for a toy for the boy, you're better off sticking with the Hasbro line. This guy is much too fragile for kids to play with, and even adult collectors need to take extra care. For me, this score has no effect on the overall, since I know going in that this isn't the kind of action figure you drag out to the sand box. But if you're looking for something for Johnny (or Jane) to play with, it's worth pointing out that this isn't it. 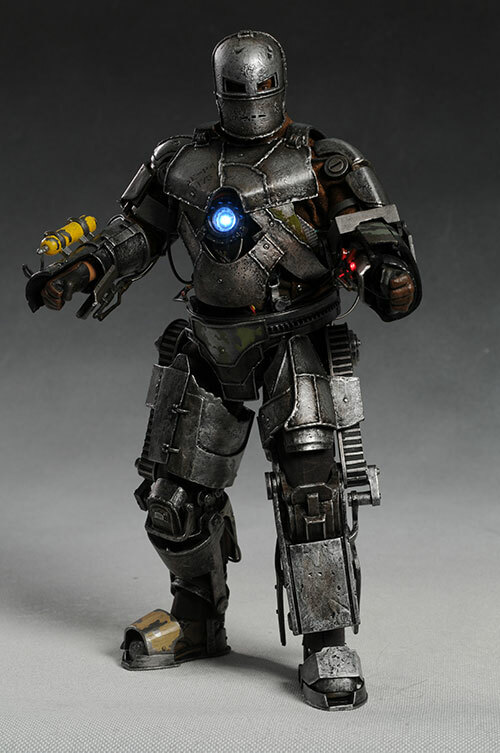 He's a bit more expensive than the 'average' Hot Toys, Enterbay or Medicom figure, running about $165. But the level of detail work on the armor is just amazing, surpassing even the Mark II and III in it's engineering creativity. You're getting what you're paying for here, no doubt about it. Had they been able to throw in a couple more accessories, and you would have been getting a real value! 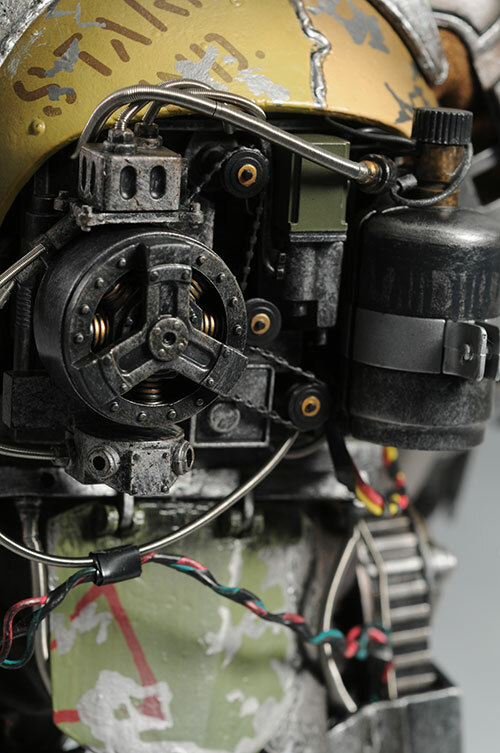 This figure has DOZENS of small exposed wires, springs, belts, and other mechanical doo-dads. There isn't any one thing you really have to watch out for - just watch out for them all! As I mentioned earlier, I found that the fire guards that slide out over the palms of the hands are very, very tight on mine. Take lots of caution with yours if that's the case. I have my quibbles with this figure. I have quibbles with almost every figure. Except for Scarlett Johannson's. And Jennifer Aniston's. And...you get the point. So it's true that the helmet doesn't attach as well as I'd like (and certainly not as well as the Mark II version). And it's true that the accessories are a tad lacking. 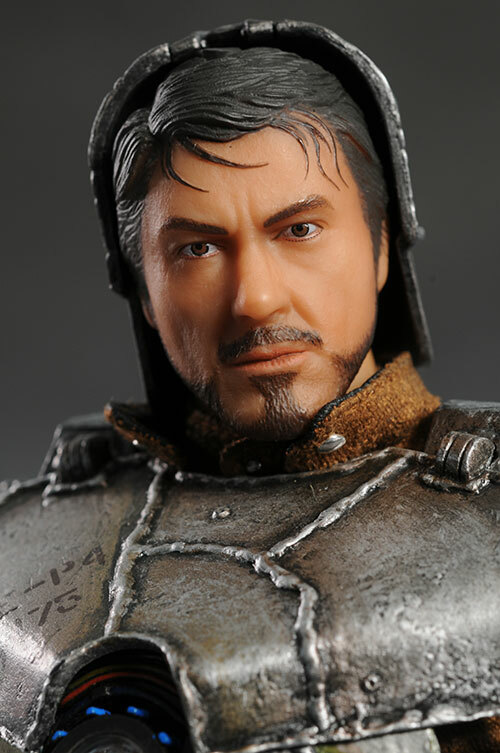 And it's true that Hot Toys is yet to absolutely nail the Robert Downey Jr. portrait. But the complexity of the armor on this outfit is just so mind blowing, that it's hard to knock it for the minor issues. Every time I picked it up I found new little details I hadn't noticed before, and the number of manual assembly operations on this thing had to be ridiculous. How they managed to get this out for a price similar to say, their Predator Dutch figure, is beyond me. I think they have some sort of alien race they've enslaved and are using for cheap labor. Or Oompa-Loompas. 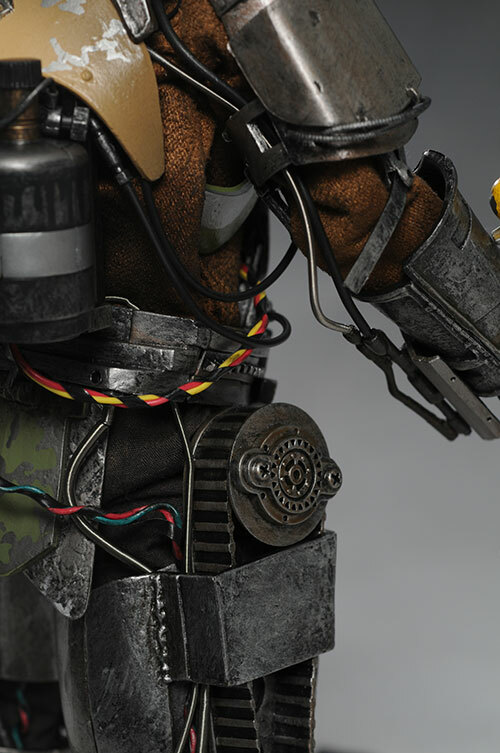 Hot Toys has reached an apogee in sixth scale, and it's hard to imagine how they can climb higher. But with companies like Enterbay breathing down their neck, I have no doubt they're looking for ways to do it. Their Godfather figure is still my top pick in the single figure sixth scale category for Best Of for this year, but at this point their Iron Man line can't be beat in the Best Line category. MOTUC is still in the running, and you can't count out Hot Toys own Dark Knight series, what with the Cop Joker and Tumbler still coming. 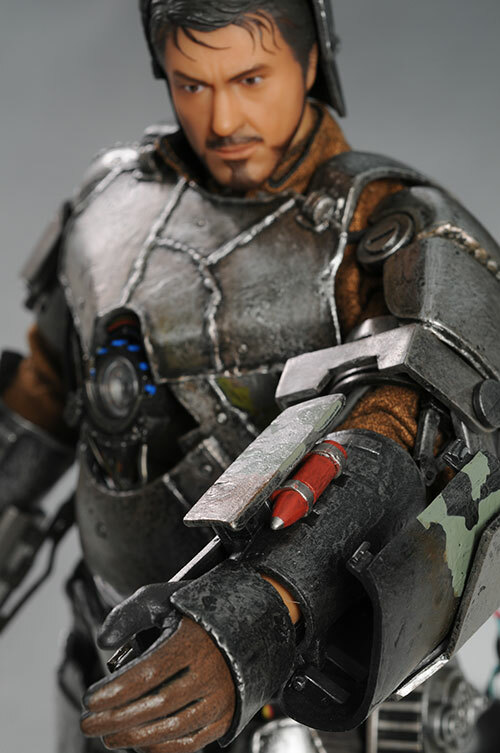 But it's not going to be easy for any line to pull a coup and topple the Hot Toys' Iron Man series. 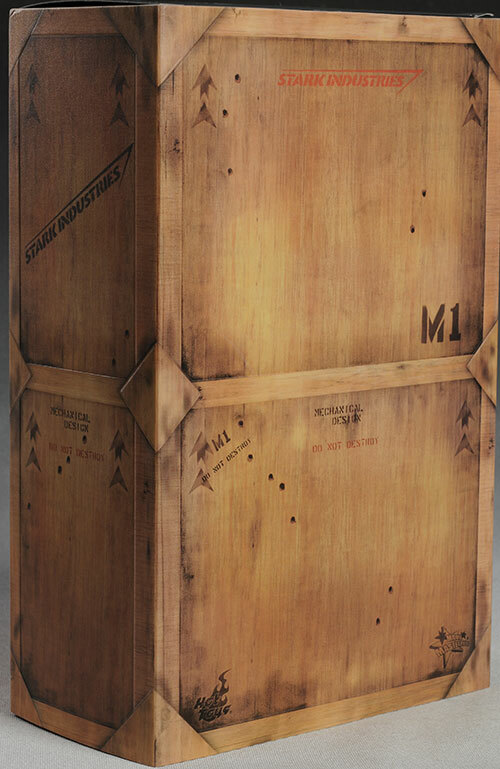 - You can get on the wait list at Sideshow (which works much better than you might think), where the Mark I is $170. 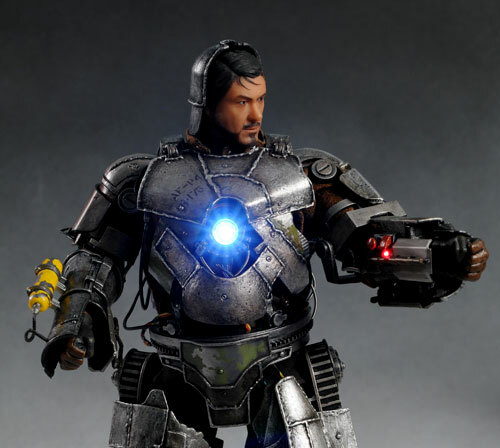 - Hot Toys has certainly done a stellar job with their Iron Man series, including the Mark III figure, Mark II figure, and additional Tony Stark men's suit.